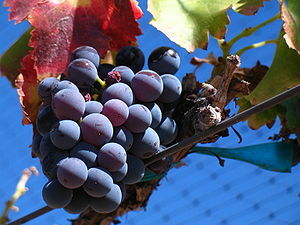 On its own, Grenache can be a bit light for some people, and too fruity. Personally, I like its fruit forward freshness with roast chicken and salads and various cheeses; tonight we’re going to try it with some chicken legs and thighs that are marinating in fresh squeezed orange juice, fresh rosemary, raw garlic, and a prepared teriyaki sauce. Grenache is nice on the cool side (cellar temperature or colder), great with picnics, or when you want something more hefty than a rose. Grenache is a red wine that won’t bog you down but instead lift your spirits. 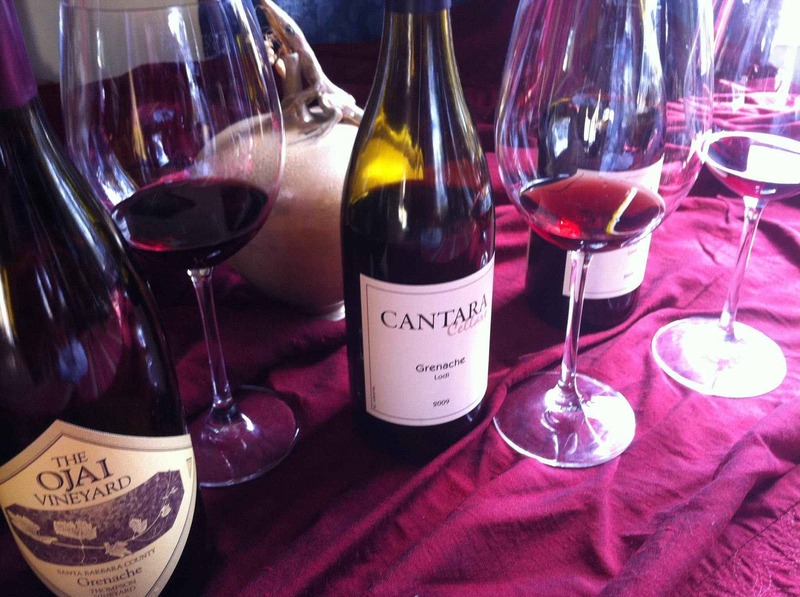 In honor of Grenache Day 2012, we tasted four: one from Horse Heaven Hills AVA by Alexandria Nichole, two from Lodi California made by Mike Brown at Cantara Cellars in Camarillo, and one from Thompson Vineyards in Santa Barbara made by Adam Tolmach at Ojai Vineyards. They were all very different and we loved them all in their own ways. All of them are gorgeous in the glass, which is typical of grenache: super pretty pink and clear, vibrant with a violet tinge on the edge. 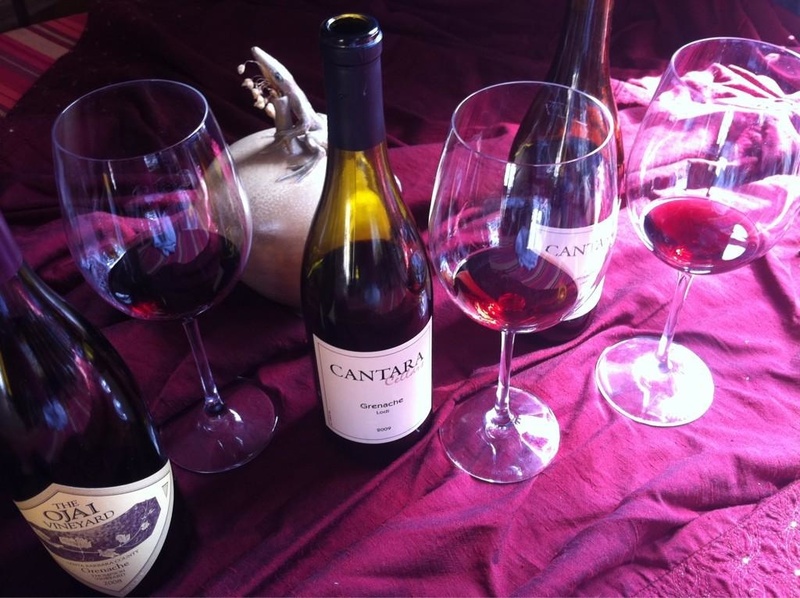 In the nose, the Cantara Cellars Grenache is very sweet and floral: violet pastelles, gardenias, like a dewy morning in a garden full of blooming flowers. On the palate, it’s light and fruity, friendly and flirty; not heavy with tannin but with nice bright acidity which allows an easy transition from appetizers to lig ht meats from salmon to chicken to pork; it can stand alone at a gathering or after work by itself. 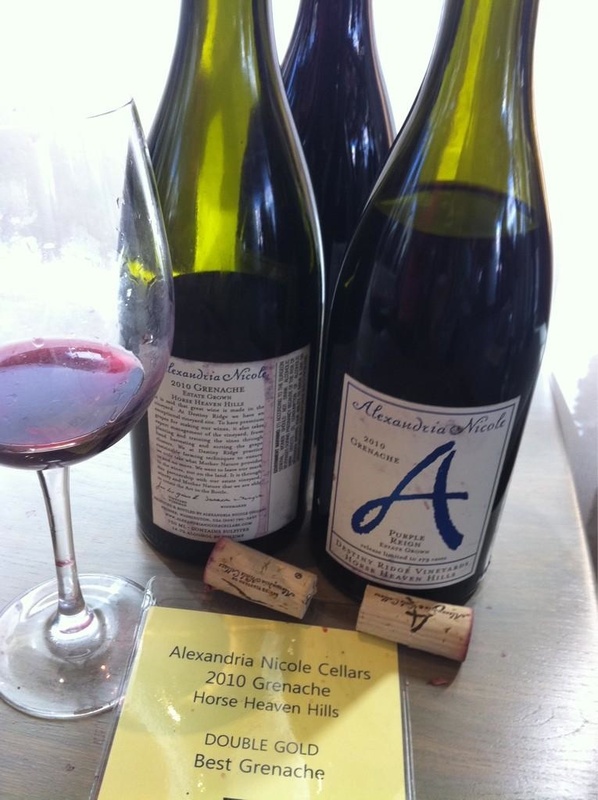 Alexandria Nicole Cellars 2010 Grenache, Purple Reign, Horse Heaven Hills was named the best grenache at the recent San Francisco International Competition; Annie and I tasted it in Los Angeles on Wednesday. This a bright sophisticated jousting wine that reminds us of Christmas–cranberry, red fruit, spice, jolly, lots of spirit but flowed quick, gets right to the point, tickling the roof of the mouth, and gone in a flash. After the 2010 Wine Bloggers Conference in Walla Walla, a group of us went to Alexandria Nichole for a tasting and a lunch (and we went away very impressed, so much so that some in our group became club members that day!) In 2011, Alexandria Nichole was named Washington Winery of the Year–we could obviously see why! The third in heft is the as yet unreleased Cantara Cellars 2009 Grenache from Lodi that is 95% grenache and 5% tempranillo; since Sue works there, she was able to get it for us! This was left in barrel for almost an additional year before bottling. And wow! Amazing what a difference a little time and tempranillo makes to spice up a grenache! The tempranillo tempers the fruitiness of the grenache with some pepper, brininess, and spiciness to the fruity grenache–almost like adding pepper to your steak or cinnamon to your cobbler–just a little dash will do you. The florals and perfume are still there but it doesn’t cross the palate as quite so sweet and it is no longer a delicate wallflower. Like its sibling, it will retail just under $30. The final wine of our grenache day line-up comes from Ojai Vineyards. It’s 80% grenache, 10% mourvedre, and 10% syrah; the fruit comes from the high elevation Thompson vineyards in the Los Alamos region of Santa Barbara County. The color is a deep ruby red with a violet ring; you can thank the syrah for that deeper color. In the nose, very fragrant with the vanilla woodsy toasted oak apparent but not overwhelming, along with violet and earth. On the palate, lots of cranberry and raspberry, classic red fruit; the nice spice comes from the syrah and a wild meatiness from the mourvedre. This wine could hold its own with just about anything you might throw at it. It has the most strength, body, heft of the four, and a fabulous, layered and lengthy finish. We loved all of the grenaches, and we’re happy to celebrate grenache whether blended a lot or a little or enjoyed all by itself! Welcome to Fall! May your harvest be plentiful! Happy Grenache Day, everyone! I am very excited to start my celebration of Grenache Day with 09 made by Cass in Paso Robles. I hope you enjoy your chicken dish – it sounds tasty! Have you decided on tonight’s menu? What will you be pairing your grenache with? Guess what I’m grateful for today? Guess what brings me peace, too? That’s right–a glas of grenache! Cheers! Have a wonderful weekend full of surprises and celebrations of all kinds, great and small!